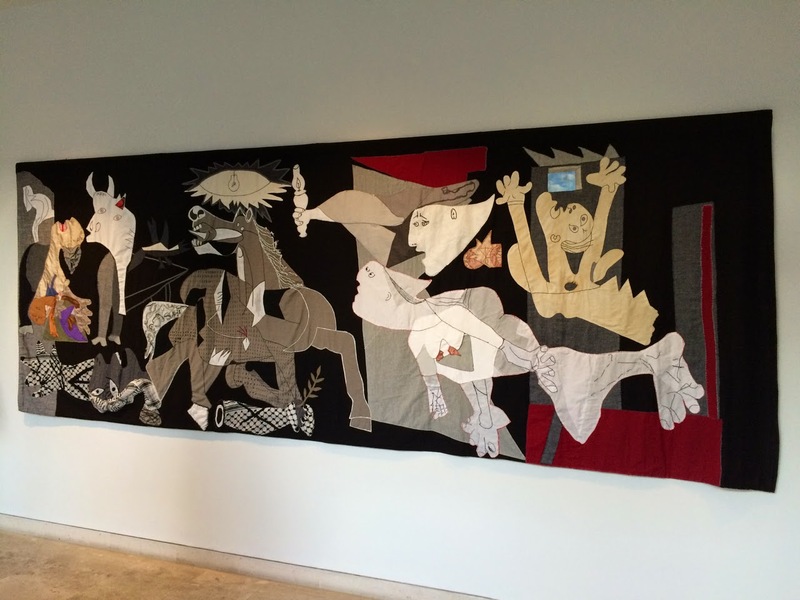 Pallant House Gallery in Chichester is currently staging a superb exhibition on the response of British artists to the Spanish Civil War (1936-39), under the title 'Conscience and Conflict'. There are paintings, drawings, posters, banners, photographs, leaflets, flyers, even a historic film sequence for which the sound has unfortunately been lost. Many of the leading artists and movements of the 30s are represented, including Henry Moore, Quentin Bell, and the Surrealists, as well as many that I had not previously come across. The painting above, of a demonstration in Battersea in 1939 in support of the Spanish Republic, is by Clive Branson. Picasso's iconic painting 'Guernica' was shown in London in 1938, and several artists make reference to it in their own works. This exhibition includes a fabric collage re-working of the image, made collaboratively over a year or more in the course of a number of workshops held across the UK and elsewhere. Goya's 'Disasters of War' series was also shown in London in 1938, and some of the artists are clearly inspired by his images. A few of the Goya prints are on show here, and you can feel as well as see the influence. 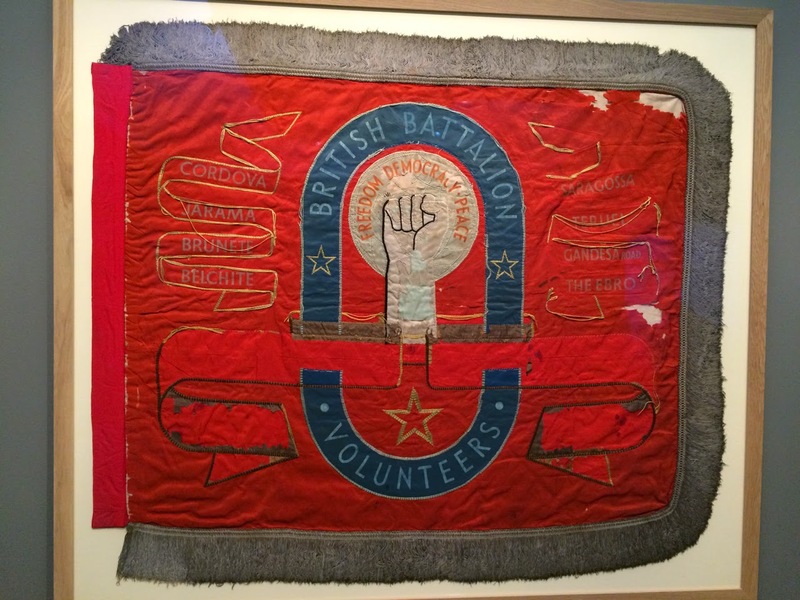 Amongst the historic exhibits are a couple of banners of the British Battalion of the International Brigades. The one shown below has been used for decades to drape the coffins at the funerals of old brigaders. The British Battalion was named after the Labour Party leader Clement Attlee, who became Prime Minister when a Labour Government was elected after the Second World War. The film shown in the exhibition has clips of Attlee welcoming brigaders at Victoria Station, on their return to the UK in 1938. There was much on show that was new to me, including a series of paintings by Clive Branson of scenes in the nationalist prisoner-of-war camp where he was detained for several months in 1938. These are held by the Marx Memorial Library in London, but unfortunately I have not been able to find any examples online that I could link to here. Alongside the major exhibition is a delightful show of a dozen prints by Terry Frost inspired by poems of Federico García Lorca. See A Match Made in Colour on his website for the effect Lorca's poetry had on him, and on his art. 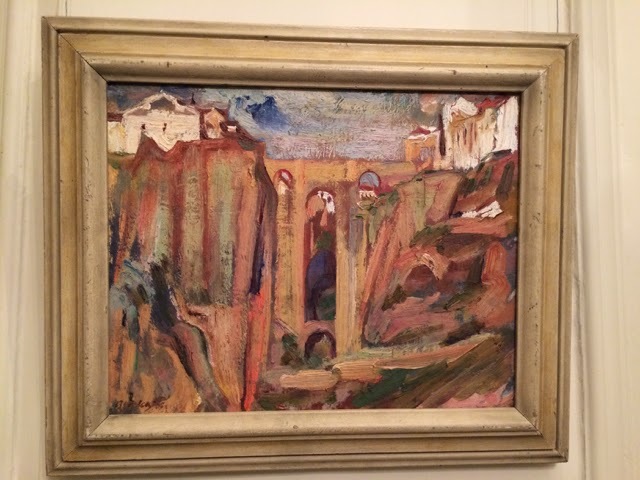 And finally, a nice surprise for me in the gallery's permanent exhibition - a few paintings of scenes in Spain by the East End Jewish artist David Bomberg, including this one of the bridge over the gorge at Ronda in Andalucía, where he lived for a year in the 1930s, not long before the outbreak of the Civil War. There's a dozen of his Spanish paintings in this series on the BBC's 'Your Paintings' site. The exhibition runs until 15 February, and is possibly transferring to Newcastle later in the year, but is unlikely to be shown anywhere else as many of the items are on loan from other galleries and individuals, and will have to be returned. So if you're within reach of Chichester, get there if you can! What we've been up to this year. It's on Google Drive - let me know if you have any problems reading it. You can print it off if you want to - it's 8 pages including photos; you can also zoom in to see at least some of the detail in the pictures. If you read it online, there's also links to some of our websites and photo collections, which tell a much fuller story. I've done this one, Jan's done one too. If you get to see them both you're doubly lucky . I met Cousin Joan yesterday. Well, Third Cousin Joan. 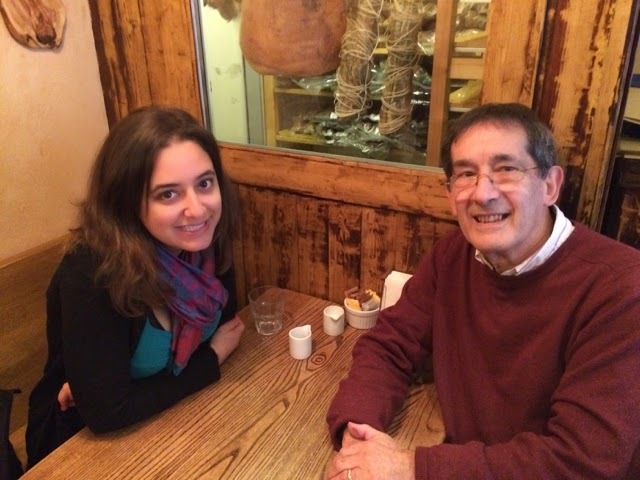 She came across me online a few months ago, but this was the first time we had met - she lives in Israel, and was coming over to London for a couple of days, so I hopped on the train and went up to see her. She had just started delving into her family history, and did a Google search for her great-grandmother, Bajla Frankenstein. Go on, try it. Second up is a post of mine from two years ago, recounting how I had made contact with Frankenstein cousins in the USA that we had previously had no idea even existed. 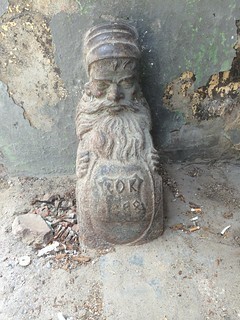 In the post I mentioned a Bajla Frankenstajn I had found, as a possible connection between my family and the 'new' cousins. "I've just started a serious genealogy project and stumbled upon this post. I am a great-grandaughter of Bajla Frankenstejn. I think we need to talk." So here we are, talking. We compared notes, and after some scratching of heads we realised that, although I'm older than her father, she and I are in fact of the same generation - we share great-great-grandparents, which makes us third cousins, I think. Her great-grandmother, Bajla, was sister to my great-grandfather Jankel Josek. She was 13 years younger than him, and his lot seem to have been quicker off the mark than hers in each succeeding generation. Joan brought with her an absolute jewel of a photo album, which had been her grandparents'; it had scores of photos from before the Second World War. I had never seen any of them before, and Joan herself was pushed to put names to more than a few of the people in them. As she showed them to me, I snapped away with my iPhone, on the café table (spot the shadows); Joan will scan them properly for me when she gets back home. 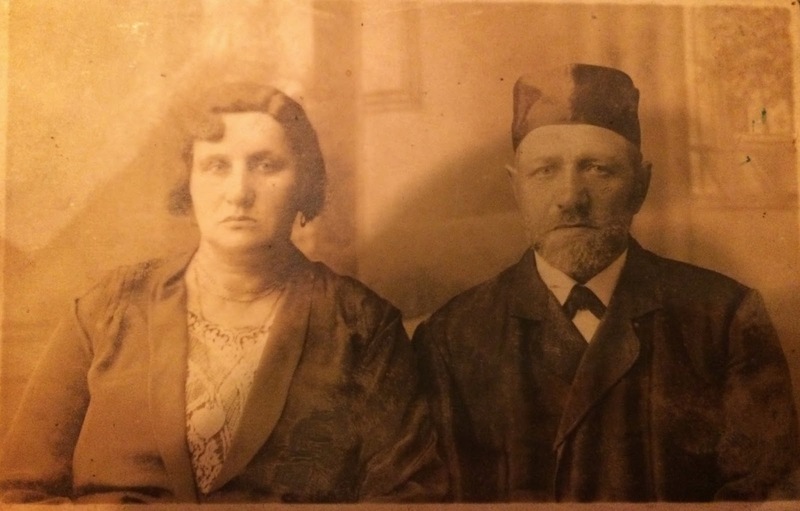 Bajla and her husband, Towje Aron Szwarc, lived in Gombin, in Poland, and had a dozen children. A couple of them died in childhood, but most of the rest went on to have families of their own. Towje Aron died in the early 1930s. Some of the children emigrated - to Panama, the US, and the UK - and thereby survived the War. 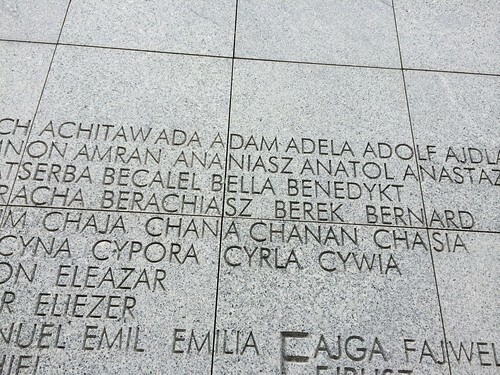 Bajla and the others stayed in Poland, and all perished in the Holocaust. The oldest of their children was Jankel, born in 1896 and a few years younger than his cousin, my grandfather Lajb. The two cousins both came to London in 1913, where Jankel became Jack Schwartz, and Lajb became Louis Frankenstein. They remained in contact at least until the late 1930s. 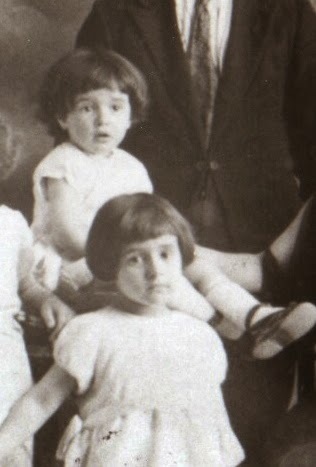 Bajla came to London to see Jack in 1930, and stayed for three months, during which time she must have seen her nephew, Louis, and his family, including my mother, who would have been 10 years old. However we have very few photos from this period, and none that seem to be of this visit. So this is the first photo of Bajla that I have seen. More than that, it is the first time I have seen a photo of anyone in the generation before my grandfather. By the way, this is at least the third time that I have been 'found' by a previously unknown cousin googling for one of their own ancestors, and coming up with a page I had written that named the person they were looking for. See Cousin Report #27, for example. 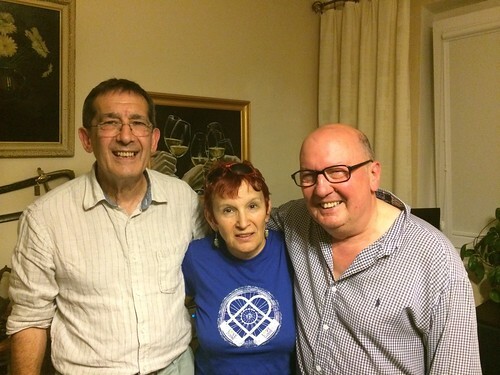 During my recent trip to Poland I went to Gdansk to see my cousins Gerald and Danka. 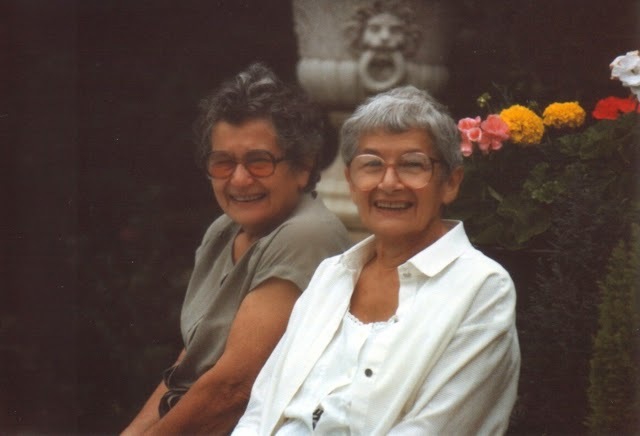 Our mothers, Marie and Lily, were sisters, born 18 months apart in London in the early 1920s. Gerald was one of the first cousins I knew - he was born a few months after me, towards the end of World War 2. I was apparently an inquisitive child, and I am told that one of my earliest scientific enquiries was an attempt to find out how his eyes were fixed to his head. Fortunately he survived that experiment. Needless to say I did not go into a career in science. After the War Lily went to live in Gdansk, in Poland, with her husband Longin, who was Polish, and Gerald was brought up there. His sisters Halina and Danka were born and brought up there. After Longin died, Lily came back to London, and Halina followed a few years later. 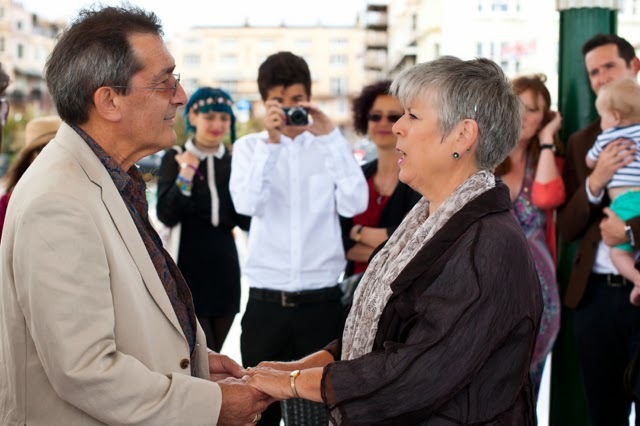 Gerald and Danka stayed in Gdansk, and brought up their own families there. Their children move backwards and forwards between the two countries, and are fluent in both languages. At the moment they each have one child in London and one in Gdansk - a European Union in miniature. This was my first visit to them in Gdansk, and the first time I had seen them since Lily's funeral in London nine years ago. There was much embracing, many stories were told, and much Bison Grass was drunk. I'd been finding out about our Frankenstein family, and Gerald had lots to say about his father's experiences during the 1930s and 40s; I'll be writing about some of this shortly on my family history sites: TwentyOne Seven and Poyln Roots. Here are some more pictures from our get-together, which included Gerald's wife Ewa, and Danka's son Jędrzej. 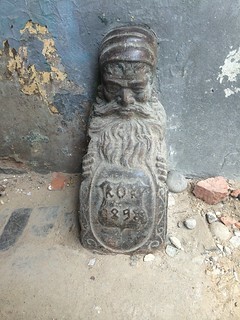 And here's some from my walks around Gdansk. 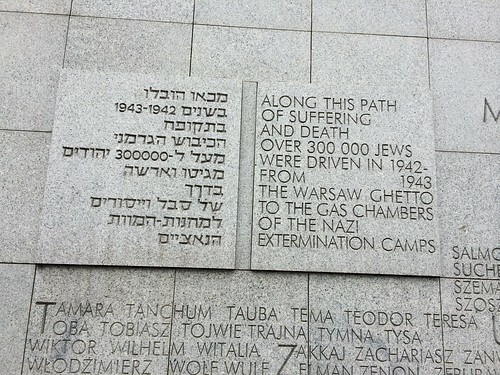 Several hundred thousand people were forcibly crammed into the Warsaw Ghetto, and then, after 18 months of terror and starvation, all but a few were transported to their deaths. We know little about their lives in the Ghetto, nor where, when or how most of them died. There are few individual accounts, and few individual memorials. 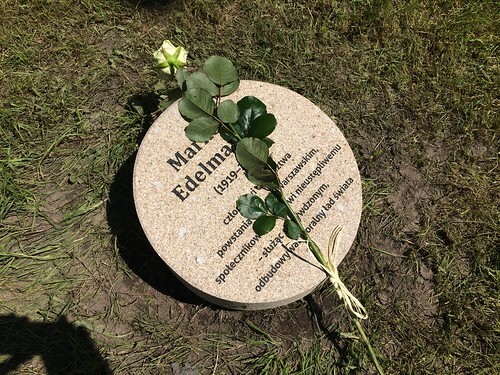 The City of Warsaw has honoured some of the heroes of the Ghetto with memorial stones or street names, and while I was there in June a 'Garden of the Righteous' was inaugurated in one of the city's parks. This commemorates those who "had the courage to defend human dignity and truth, and help victims during totalitarian times and genocides", anywhere in the world. 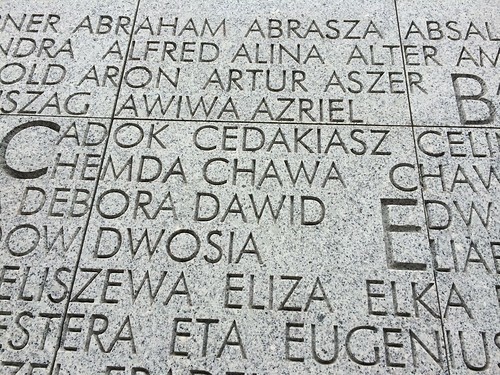 The first people honoured there include several who were involved in the Polish resistance to the Nazis, including in the Ghetto. Marek Edelman was a leader of one of the sections of the Bund, the leading Jewish Socialist political party, within the Ghetto. He became leader of the Ghetto Uprising in 1943, and when that was crushed and the Nazis burned the Ghetto to the ground, he escaped through the sewers to the 'Polish' part of the city, and took part in the Warsaw Uprising in 1944. Shortly after the War he published a memoir, The Warsaw Ghetto Uprising, which is one of the few first-hand accounts that survived. 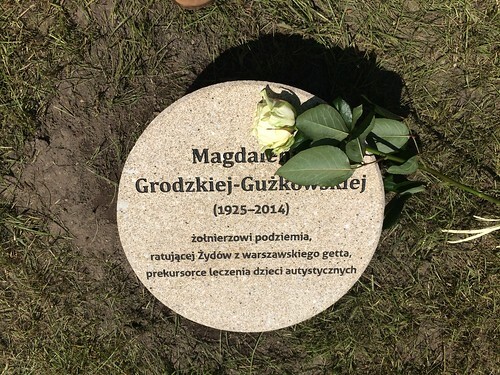 Magdalena Grodzka-Guzkowska worked for the Polish Resistance from the age of 14, helping to identify Poles who were collaborating with the Nazis. She helped Irene Sendler rescue Jewish children from the Ghetto, and fought in the Warsaw Uprising. 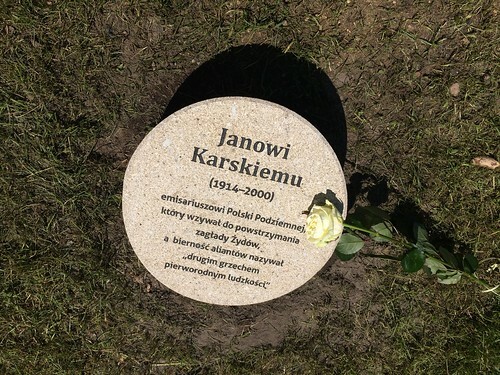 Jan Karski was a member of the Polish Resistance. He was sent on several secret missions to London and to the USA to inform the Polish Government in Exile, and the Allied Governments, of the situation in Poland. He was smuggled into the Warsaw Ghetto to see the situation at first hand, and also managed to see the holding camp for the Belzec extermination camp. His reports were presented to the Allies in a note titled 'The Mass Extermination of Jews in German Occupied Poland'. He had meetings with British Foreign Secretary Eden, and with US President Roosevelt. However the Allies did not appear interested, and took little or no action. 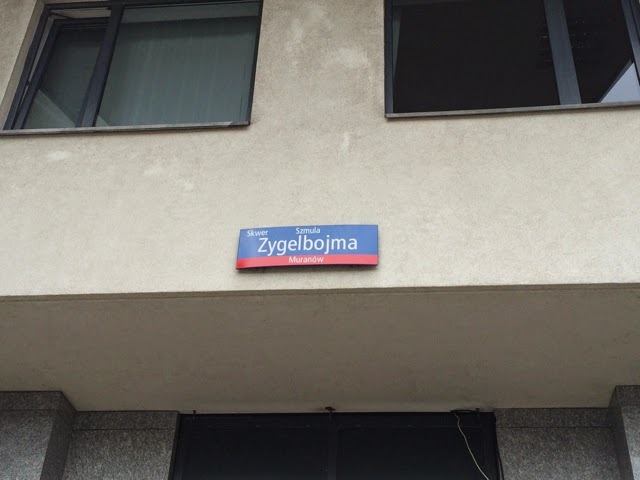 The street sign at the top is for the square named after Szmul Zygelbojm, a leader of the Bund party and its representative in the Polish Government in Exile, based in London. He managed to escape from Poland in December 1939, and spent the following years trying to persuade the Allies of the dire situation of the Jews in German-occupied Poland. When the Warsaw Ghetto Uprising was crushed, in May 1943, and he learned that his wife and son had been killed there, he committed suicide in protest at the indifference of the Allies to the fate of the Jews. Emanuel Ringelblum was a historian, specialising in the history of the Jews in Poland. In the Warsaw Ghetto he established 'Oyneg Shabbos' - 'Sabbath Delight' - a secret group dedicated to documenting what was happening to the Polish Jews. They collected thousands of documents ranging from personal accounts to scientific reports and Nazi decrees. 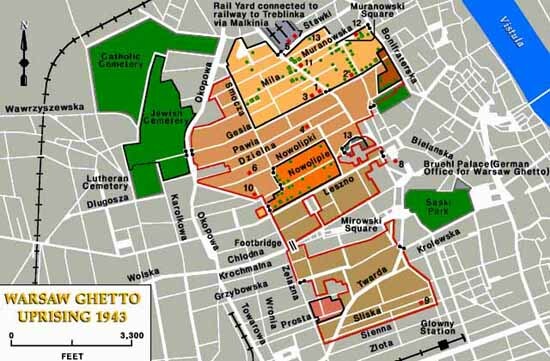 As the destruction of the Ghetto commenced in 1943, they put the documents in milk-cans and metal boxes, and hid them in the cellars of a number of Warsaw buildings. Ringelblum managed to escape from the Ghetto with his family, but they were discovered and executed along with the Poles who had hidden them. In the years after the War some of the boxes and milk-cans were discovered, but there are still some that have never been found. Ringelblum's diary notes were published in English as Diary of the Warsaw Ghetto (this is only a brief extract). There is an excellent lecture on his life by Henry Abramson: Emanuel Ringelblum and the Warsaw Ghetto. The Jewish Historical Institute in Warsaw is named after him. Wladyslaw Szengel was a poet, journalist and songwriter before the War, and he continued these activities in the Ghetto. There is an account of his life on the web-page Wladyslaw Szengel, and a few recording of his songs. 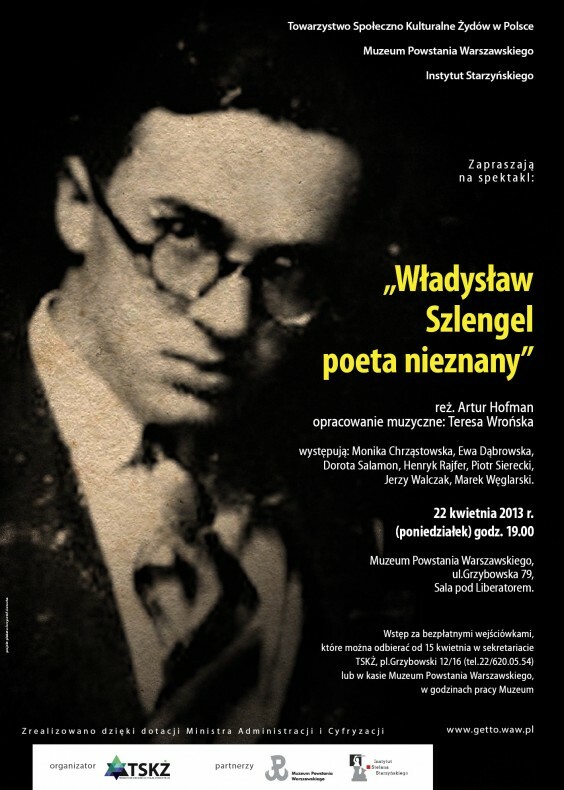 See Władysław Szlengel - The Ghetto Poet for poems in Yiddish, Polish, and in English translation, including some very powerful evocations of life in the Ghetto. He was killed during the Warsaw Ghetto Uprising in 1943. "We knew perfectly well that we had no chance of winning. We fought simply not to allow the Germans alone to pick the time and place of our deaths. We knew we were going to die. Just like all the others who were sent to Treblinka.... Their death was far more heroic. We didn't know when we would take a bullet. They had to deal with certain death, stripped naked in a gas chamber or standing at the edge of a mass grave waiting for a bullet in the back of the head.... It was easier to die fighting than in a gas chamber." A chilling moment on my recent visit to Warsaw. 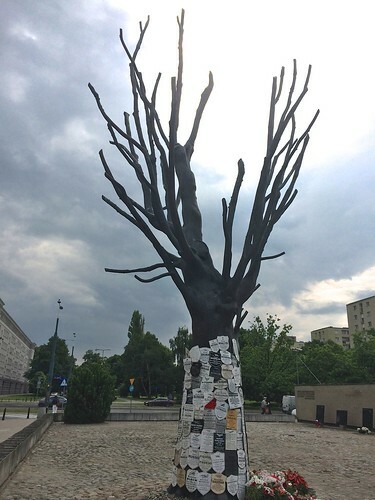 This is a memorial tree at the notorious Pawiak prison, where the Nazis held, tortured and murdered thousands of political prisoners, both Jews and non-Jews, during the course of the War. 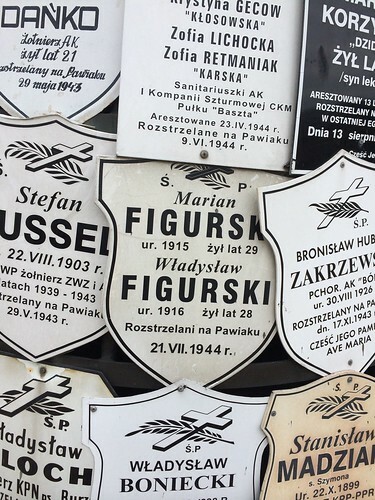 The Figurski brothers, Marian and Wladyslaw, were killed there on the day I was born. This is where you have to use your imagination. 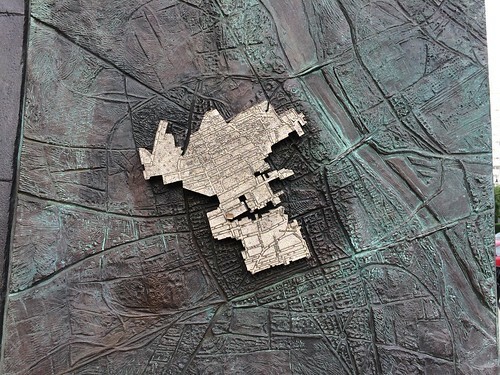 The buildings of the Warsaw Ghetto, as much of the rest of the city, were totally destroyed during the crushing of the Ghetto Uprising in 1943 and the Warsaw Uprising the following year. 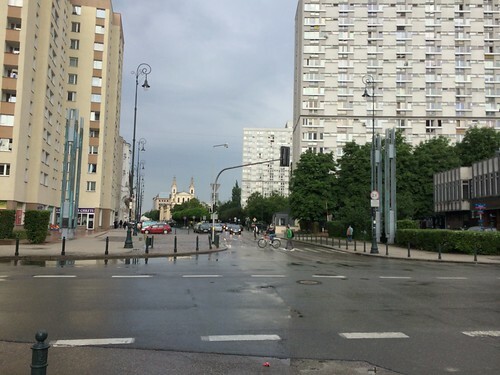 The post-War rebuilding largely retained the street plan, though many streets have been re-purposed. This was Nalewki Street, one of the busiest commercial streets of the old town, and an important meeting-place during the time of the Ghetto. At the far end of the street was one of the Ghetto gates through which those with permits could pass in and out. It now runs through a pleasant park, with trees, flowers and a children's playground. All that remains of pre-War Nalewki are the tramlines. 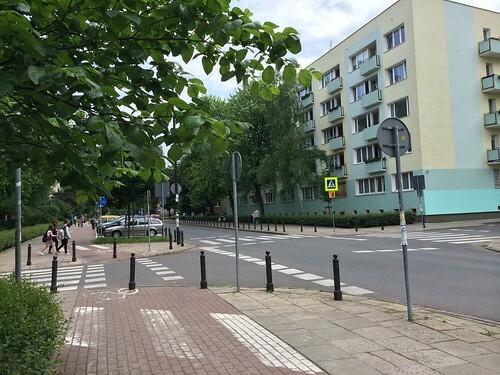 The photo below is Chlodna Street, site of the Footbridge of Memory, looking between the posts that mark the site of the bridge, towards what was the central area of the Ghetto. Before the War this was the heart of the Jewish quarter of Warsaw. 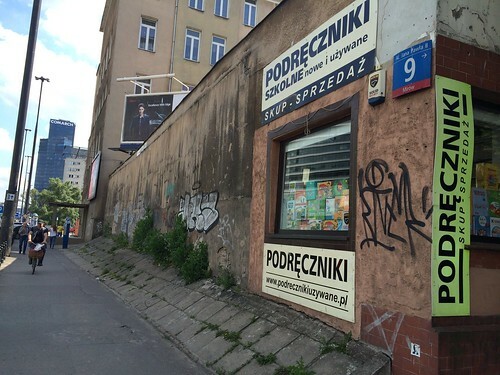 Near Jana Pawla Avenue there is said to be a section of the Ghetto Wall still standing. I'm not sure if this is it - there is nothing to mark it here, no plaque, no sign. 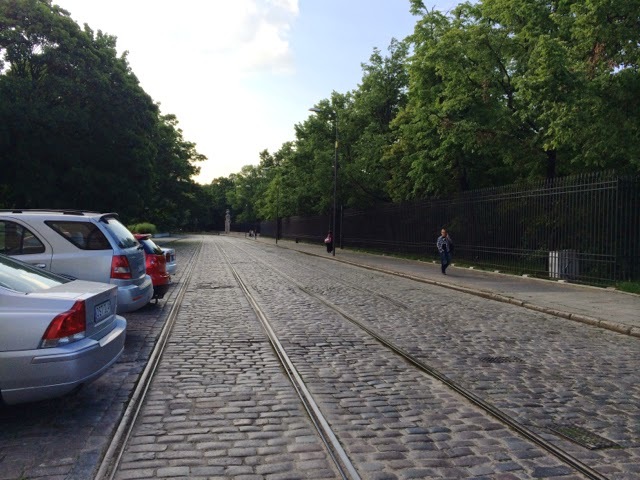 The Wall enclosing the Ghetto was some 17km (11 miles) long. See this account of the remaining section of the Wall, with photos and a precise location. This iconic building, on the corner of Prozna Street, is one of the few that remain from the time of the Ghetto. The photos of Ghetto inhabitants on the windows are a haunting reminder of the lives that were taken. 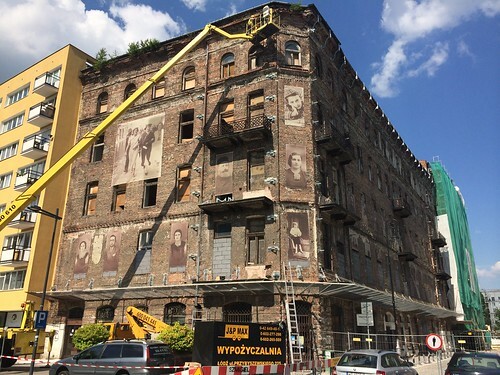 There is an excellent account of the history of the building, with some superb photos, which gives an insight into the Jewish community in pre-War Warsaw, and the controversies in more recent times over the building's retention and restoration. 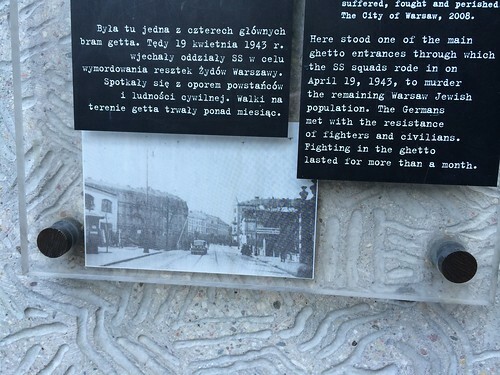 Chlodna Street ran straight through the heart of the Ghetto, but Jews were not allowed to use it. 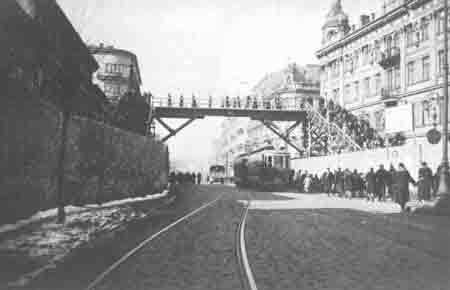 The Ghetto was thus divided in two, and in order to get from one part to the other, Jews had to use this wooden bridge. The street itself is for Gentiles, the tram too. The walls which form the boundary of the Ghetto are some 3 metres high. The Nazis used Jewish forced labour to build them, and to build the bridge as well. A few years ago the Poles erected this memorial to the bridge and what it symbolised. 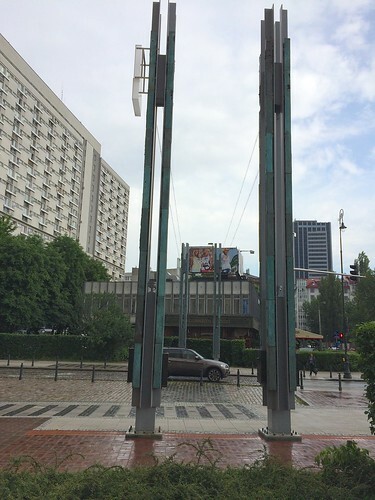 Two pairs of metal poles stand where the bridge once stood, connected by optical fibres which at night light up to project an image of the bridge across the street. The Umschlagplatz - 'Collection Point' - was where the Nazis gathered the Jews of the Warsaw Ghetto for deportation to the Treblinka extermination camp. From July to September 1942, some 300,000 were deported. Along the walls of the memorial are inscribed hundreds of Jewish names, to commemorate those who were sent to their deaths from here. The names are symbolic as no individual records were kept - this was mass murder. 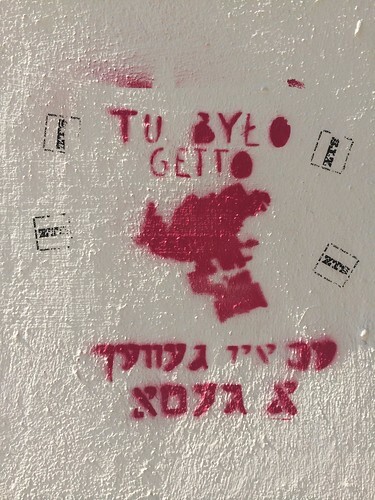 We believe, though we cannot be certain, that some members of our family were sent to the Warsaw Ghetto from their homes in Gombin, about 100km away. They didn't survive the War, and may well have been sent to their deaths from here. Amongst those that perished were my great-grandfather's sister Bajla, and my grandfather's sisters Chawa and Chaja, along with several members of their respective families.